At the Duke City Volleyball Academy we have one mission: to leverage the game of volleyball, as the ultimate team sport, to prepare young athletes for adult life. The lessons that are learned as a team player will provide our athletes a jump on how to deal with personal challenges throughout their lives. We do this by maintaining a clear club and coaching philosophy and by implementation of a training system that promotes a clear and consistent message. Our club philosophy is simple: Success is a consequence of confidence, drive and breadth, as well as a little patience. Success does not result from a focus on winning. However winning is surely a result of a focus on success. We focus on success at Duke City Volleyball Academy. To accomplish this we focus on the players themselves and on their confidence, drive and breadth. And we always preach a little patience. We strive to teach through example, perspectives on leadership, confidence and humility, and how breadth and balance are keys to success. We stress creativity and how to accept failure as a lesson for success. 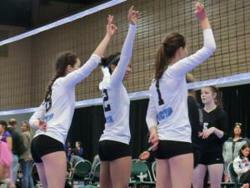 We strive to teach others and to learn ourselves, which is why we call ourselves The Volleyball Academy. Our system is how we enable our philosophies. Fundamental skills and how those skill are employed on the court and during play will be taught to players and coaches with a consistent style. How to deal with “out of system” play, basic team strategies, and offensive and defensive systems will be provided as guidance to coaches to implement based on team dynamics. And so coaches are encouraged to be creative with their strategies and implementations within the bounds of consistent fundamentals. To this end, we will implement a system that incorporates group training as well as individual and team coaching. During group training, coaches will learn consistent solid teaching fundamentals from other coaches, players will hear a consistent message from all coaches, and players will have the opportunity to learn from other players. Our goal is for a consistent foundation coupled with creative play. During team practice our coaches take those fundamentals and build a successful team dynamic and strategy that works best for their players and teams. Are you interested in being a part of our esteemed coaching staff? Interested in becoming a sponsor? Contact Duke City Volleyball for more information. ©2019 Duke City Volleyball / SportsEngine. All Rights Reserved.